I saw Samsara at Toronto in 2011, and then it disappeared. I put it on my Top Ten list in hopes people would seek it out, if possible. A year later, the world finally took notice and Samsara was released in theaters across the United States. I breathed a sigh of relief and waited eagerly for the Blu-ray release. That day is here. 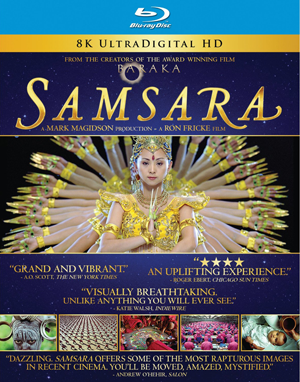 Samsara is now on Blu-ray, and it’s poised to become your go-to disc for showing off picture and sound in your home theater. If you don’t know what Samsara is, imagine Baraka or Koyaanisqatsi (both of which Samsara director Ron Fricke contributed to). It is a nonnarrative film, but it’s not exactly a documentary, either. It’s more like a musical composition, with movements, passages, and phrases made up of images. The disc’s extra features will tell you that Fricke and Magidson edited the footage without sound. They created the entire film, silent, then added the music later. And yes, there is an exotic musical score that was composed to complement the images. You can find my enthusiastic mentions of Samsara elsewhere on this site. For now I’ll focus on the Blu-ray disc. Your first glimpse of the disc is a one-minute preview of some of the film’s more memorable images, playing just above the menu choices. The menu is simple and clear, and the gorgeous picture is a nice preview of what is to come. Samsara was shot on 70mm film at some of the world’s most beautiful locations, (not to mention a few of its industrially manufactured landscapes). It was edited at a low resolution, and then when it was finished, each 70mm frame was scanned at 8k resolution — twice as high as current high-end digital projectors are capable of showing — then downsampled to make 4k and 2k releases for projection at America’s theaters. The Blu-ray also comes from this impressive pedigree. You will notice the level of detail on your TV. A very early shot shows billowing clouds of smoke and steam from a volcano. But look closely and you will see tiny lava bombs of different shapes flying from the mouth of the volcano. I didn’t think my TV was capable of rendering detail as fine as that, but apparently it is. While the visuals of Samsara on Blu-ray are groundbreaking, I don’t think home audio was as undiscovered a frontier. Don’t get me wrong, Samsara sounds great. The gongs and singing bowls provide an eerie, yet organic texture that surrounds you as you watch. Later scenes of traffic and manufacturing excite with more drums and percussion. But for my home theater, digital sound encoding might have already been maxed out. Nevertheless, the combination of immersive sound and unprecedented detail makes Samsara the Blu-ray to use to test and showcase your home theater. The documentary extra features strike the perfect balance between informative and brief. There are 6 features ranging from about 3 to about 15 minutes: concept, production, editing, music, technical approach, and filmmakers. There is also a Play All button which will take you just under an hour to watch. I watched them all in one setting and was not bored. There was something interesting in each segment, so I’d recommend not skipping around. If you watch them all you will get to know the faces behind the movie: Mark Magidson, producer and editor; Ron Fricke, director; and the three key composers: Michael Stearns, Lisa Gerrard, and Marcello De Francisci. Fricke really comes across as the visionary while Magidson seems more like the technician. For example, Fricke says “I’m not working from my head. I’m working from a feeling.” Magidson, on the other hand, is interviewed in an editing suite in front of computer monitors. The documentaries offer some interesting anecdotes about producing Samsara. For example, traveling the world with real film in a post-9/11 world is much more difficult. Every airport wants to x-ray all your stuff, which would render the unprocessed 70mm footage unusable. And Fricke talks about his signature still-life portraits of faces: he says letting subjects talk about themselves makes them too specific; too tied to a culture, an accent, a nationality. Shooting their portrait silently allows you to look into their souls. One interesting omission from the disc is any mention of films ending in-qatsi. Magidson mentions the years of experience of Alton Walpole, who collaborated on Koyaanisqatsi with Fricke and Godfrey Reggio. Magidson seems to catch himself and says “nonnarrative films” instead of mentioning Koyaanisqatsi by name. I’ve long been a fan of Reggio and Fricke; I’ve even interviewed Reggio. I would hate to think there was any bad blood between them, because together they created an unprecedented style of cinema; they ought to be proud of each other. Maybe “Koyaanisqatsi” is just too big a mouthful for Magidson to say. The Internet Teaser and Theatrical Trailer didn’t do much for me, but are included for completeness. If possible, calibrate your system. Then settle in for some of the best photography and sound you’ll see in your home theater. If you’re interested in the why or the how of Samsara, watch the documentary features. Go ahead and Play All. For extra credit, watch the movie again with the sound off to see what Magidson and Fricke saw when they handed the finished picture track to their composers.